While dental health is a very important aspect of overall well-being, there are many people that tend to neglect it. A lot of people spend a fortune on products such as vitamins, supplements, and skin products in order to look and feel good. However, when it comes to their oral health they make do with a quick brush twice a day and perhaps some mouthwash if they are really dedicated. It is important to remember that problems with your teeth can lead to all sorts of issues. The areas between your teeth, known as the interproximal or interdental area, can harbor a lot of germs and bacteria, and simple brushing and gargling won’t do much to help. You need to be able to get to the areas between each of your teeth so that you can remove any debris such as food particles. Unless you do this, the debris will be left there to fester and this could eventually lead to infections, gum problems, and even tooth loss. In addition, it can lead to very bad breath, which can cause embarrassment and stress for individuals. In order to tackle the problem of cleaning between the teeth, you need to invest in a good flossing product. These products are designed to get between those tiny gaps so that any particles and debris can be effectively removed. You can then brush and gargle as normal and your mouth will feel noticeably cleaner and fresher. Do bear in mind that flossing is not something that you should do once or twice before the novelty wears off. It is also not something that you just do on occasion. This should be part and parcel of your oral health routine and should be done on a daily basis. If you are under the impression that this sounds like way too much hassle, think again. Flossing takes just a few minutes and considering the oral benefits it provides this is a few minutes very well spent. All you need to do is find the flossing product that best works for you. Flossing amongst people in the United States has become increasingly popular over the years. We’ve all seen movies where someone is standing at the sink busily flossing. Well, this is exactly what many people love to do here in America. However, there are still way too many people who do not put enough emphasis on flossing as part of their dental health regime. 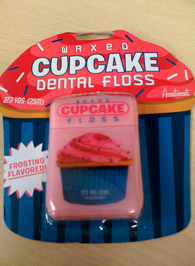 Archie McPhee Cupcake Dental Floss: Okay, we all know that part of looking after your dental health is to avoid sugary foods. However, this is far easier said than done if you happen to be one of the many people with a sweet tooth. The great news is that you can now have the best of both worlds. This cupcake dental floss has a delicious frosting flavor that will help to keep those cravings at bay while also keeping aiding your oral health. The waxed floss is ideal for cleaning between your teeth effectively but you can enjoy the added bonus of frosting flavor as you do it. Spry Dental Sponge Floss with Xylitol: Derived from plants, xylitol is a natural sweetener and over recent years has been proven to offer oral health benefits. This is a product that can help to neutralize pH levels in the mouth as well as reducing the risk of bacteria getting stuck to the teeth. With this dental floss, you can enjoy the benefits that xylitol offers. The sponge floss is gentle on the mouth, very effective and cleaning the interdental areas, and is coated with xylitol to boost your oral health and provide you with a great taste while you are flossing. 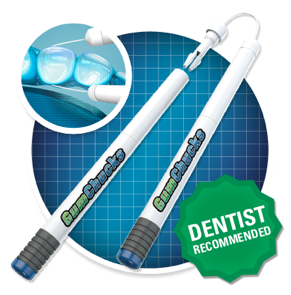 Gem Dental Power Floss: When you visit the dentist, you will have seen the various high-tech tools that they use to get your teeth looking and feeling super-clean. Well, you can now experience this in your very own home with Gem Dental Power Floss. This innovative tool uses Air Fusion Technology to direct water between the teeth and remove debris as gently but effectively as possible. The product is very simple to use, as all you need to do is fill it with water, direct it toward the gums and teeth, and press the button. You don’t even need power or batteries, making this the ideal tool for flossing both at home and when you are away. As you can see, the world of flossing products has changed dramatically over recent years. We are no longer resigned to using tools that put you through pain and discomfort in order to enjoy better dental health and hygiene. With these products, you can look forward to a far more convenient and comfortable way of getting your teeth really clean. Better still, you can use some of the more fun products to teach your kids about the value of flossing – something that they will thank you for in years to come.